Falling in love with Hoi An in the central province of Quang Nam is to fall in love with its wonderful alleyways, which for locals are the soul of their home town. According to the town’s documents, major roads in Hoi An, such as Tran Phu, Nguyen Thai Hoc and Bach Dang were formed in the 17th century along the Hoai River. A system of alleyways then gradually evolved to link those roads. Many alley names remind locals and visitors of historic and folk legends. Sica Alley once had the French Sica alcohol stores, and Ba Le Alley had the Ba Le well with water that was sweetest and coolest in Hoi An. There are other wells believed to be blessed by beneficent genii, the ancient spirits that were part of the seventh century Champa Kingdom, a Hindu-Buddhist culture with trading routes around Southeast Asia. 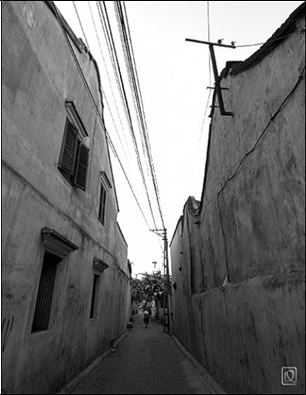 Alleys in Hoi An are often so narrow they can only fit two or three people walking alongside each other- and their sides are the sides of houses or garden walls. The alleys are long and covered with moss and lichen and many contain small well that have witnessed families and neighbours gathering for generations. Thai Te Bieu lives in a home in an alley on Tran Phu Street with four generations of his family. His son and daughter have set up businesses in the city centre. "If my descendants must, they can move to other places, but I can’t leave this alley," said Bieu. "There are so many memories." The director of the Hoi An Centre for Monument Management and Preservation, Nguyen Chi Trung, said the alleys were integral parts of Hoi An’s architecture, establishing its links with the past. "For so many years, the ancient houses have existed along with the lanes to serve them," Trung said. "Many tourists have fallen in love with Hoi An just because of the alleys," Trung said. "They provide a sense of a countryside community in the town." For Hoi An people, the alleys are bridges for neighbourly affection. Pham Thi Loc and Tran Thi Cung, who live in an alley on Nguyen Thai Hoc Street, realise this after decades of togetherness. "We live in two different houses, but it’s just like one," they said. "Although we are not relatives, we love each other like sisters and are always together. "A special thing is that tourists quickly acquire our way of behaving," Loc said. "As the paths are narrow, they always give way to others with friendly smiles." 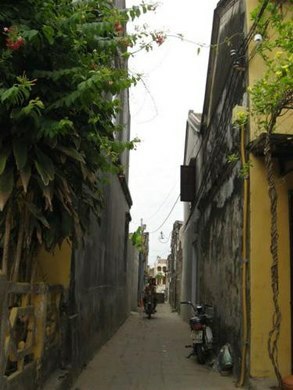 Trung said the meaning of alleys would be promoted in the future when Hoi An became a city completely without cars and motorbikes. "People will prefer to walk through alleys to save space and time," he said. Hoi An authorities said they were determined to keep the alleys intact as some had become busy trading points with booming tourism. "To preserve the soul of the city, we attach special importance to keeping waves of traders from entering the alleys," Trung said. "Streets without motor vehicles were moves to keep that soul." "We believe that locals and tourists comprehend the spiritual value of each alley they are living in or walking through."